Received: April 13, 2017; Revised: July 23, 2017; Accepted: July 29, 2017; Published online: December 31, 2017. This is an open-access article distributed under the terms of the Creative Commons Attribution Non-Commercial License (http://creativecommons.org/licenses/bync-nd/4.0/), which permits unrestricted non-commercial use, distribution, and reproduction in any medium, provided the original work is properly cited. The growing proportion of individuals suffering from chronic kidney disease has considerable repercussions for both kidney specialists and primary care. Progressive and permanent renal failure is most frequently treated with hemodialysis. The efficiency of hemodialysis treatment relies on the functional status of vascular access. Determining the type of vascular access has prime significance for maximizing successful maturation of a fistula and avoiding surgical revision. Despite the frequency of arteriovenous fistula procedures, there are no consistent criteria applied before creation of arteriovenous fistulae. Increased prevalence and use of arteriovenous fistulae would result if there were reliable criteria to assess which arteriovenous fistulae are more likely to reach maturity without additional procedures. Published studies assessing the predictive markers of fistula maturation vary to a great extent with regard to definitions, design, study size, patient sample, and clinical factors. As a result, surgeons and specialists must decide which possible risk factors are most likely to occur, as well as which parameters to employ when evaluating the success rate of fistula development in patients awaiting the creation of permanent access. The purpose of this literature review is to discuss the role of patient factors and blood markers in the development of arteriovenous fistulae. Proper functioning of an arteriovenous fistula (AVF) is vital for hemodialysis treatment and is a significant concern for kidney specialists and vascular surgeons. For patients with end stage renal disease (ESRD), an autologous fistula is the most suitable vascular access option. It has the lowest mortality rate compared to arteriovenous graft (AVG) and central venous catheter (CVC), and it has the lowest rate of re-intervention . Due to these advantages, the National Kidney Foundation guidelines endorse the use of native AVF, which has a 65% primary success rate amongst patients about to commence hemodialysis . According to Irish et al , vessel obstruction or immaturity accounts for 20% to 54% of cases with primary failure of AVF. Regional variations in practice patterns contribute to vascular access outcomes and patient morbidity and mortality. Considerable variation was observed in the practice patterns of hemodialysis access operations. A study conducted by Dunn et al  found significant variation in practice patterns; general anesthesia use varied from 1.9% to 74.4%; preoperative venous imaging by ultrasound or venogram varied from 72.1% to 95.9%; native AVF vs. non-AVF varied from 58% to 85.1%; inadequate veins were cited in 68% of non-AVF cases, and the distribution of upper extremity AVF type across regions varied widely. Similarly, Asano et al  did not find meaningful relationships between AVF survival and various physician and staff practices. Final AVF failure rates were higher in facilities with higher median blood flow rates. They were also greater in North America and Europe/Australia/New Zealand than in Japan, but this difference was substantially attenuated after accounting for regional differences in facility median blood flow rates. Fistula maturity is believed to be reduced by a number of demographic and clinical elements. Previous research indicated that a high rate of AVF maturation is influenced by lower body mass index (BMI), young age, male gender, and the absence of peripheral vascular disease (PVD) and diabetes [6,7]. Prognosis regarding the efficiency of a fistula is made with the help of duplex ultrasound, an instrument that enables evaluation of the success of fistula development [8,9]. It might be possible to enhance vascular access results by constructing a more comprehensive picture of factors involved in the efficient development of fistulae. In addition, this will generate important data during pre-surgery evaluation that surgeons can use for decision-making. Independent predictive markers can be beneficial in anticipating the success rate of fistula development without requiring invasive or expensive tests. Research studies conducted on the predictive markers of adequate and operative fistulae have failed to reach a consensus because they focused on different aspects and used different definitions of maturation, study design, clinical factors, and patient samples. Thus, surgeons are confronted with the challenge of classifying different risk factors and deciding which parameters to use to evaluate the possibility of successful fistula development. The purpose of this literature review is to discuss the role of patient factors and blood markers in the development of AVF. Multiple factors are involved in the functional maturation of AVFs, such as age, gender, and blood markers. Fig. 1 shows factors associated with AVF maturation in patients with advanced renal failure. It is possible that older people are at greater risk for diabetes and PVD. A meta-analysis of 13 cohort studies (of which 11 were retrospective) provides the best available evidence and shows that elderly individuals with radiocephalic AVF had a higher primary failure rate and decreased patency . However, the definitions of “elderly” in the included studies ranged from 50 to 70 years, and the review was specific to wrist AVFs. Comparative studies on AVF patency in elderly and younger individuals have been conducted [11–13]. In particular, the effect of the intima-media width of radial arteries on early failure of radiocephalic AVF was studied using 90 individuals with ESRD who had undergone vascular access surgery . The surgery removed 10 mm of partial arterial wall using an elliptical type microscopic analysis, and a link among higher age, higher AVF maturation failure, and intima-media width was revealed. The result of higher intima-media width is loss of vascular elasticity and vessel luminal narrowing, which cause a rise in arterial rigidity. Yan et al  showed that diabetes is a separate risk factor for intima-media width in patients with kidney disease. Other studies, however, did not support worse AVF patency rates in patients. Lok et al  conducted a single-center, retrospective analysis of over 440 AVFs. The study compared AVF results in different age groups to find that the construction of AVFs should not be affected by age. However, single center study results might have limited external generalizability. Other study results also show no relationship between primary AVF patency rates and age. Thus, the link between degree of AVF success and age is unclear, and no definite conclusions can be made [11,16]. Research is now questioning the traditional belief that men have larger vessel diameters than women. In the Haemodialysis (HEMO) Study, female gender was identified as a significant predictor of AVG rather than AVF use , but there is little specific evidence for AVF patency differences between genders. A longitudinal study examined vascular access complications in a large cohort (n = 833) of hemodialysis patients who had permanent access in use one month after starting hemodialysis therapy and compared complications in men and women . The study found that female gender was associated with a relative hazard of 1.58 (95% confidence interval [CI], 1.05–2.35) in AVF patients compared to male AVF patients. However, a retrospective study of over 190 individuals revealed variations in vasculature between men and women. Vessel diameters were calculated at 12 arterial sites and 17 venous sites, revealing that no considerable variations exist in these diameters between genders. Furthermore, a meta-analysis indicated that one-year patency levels and maturation for radiocephalic AVFs are similar for men and women . AVF dysfunction remains a major contributor to the morbidity and mortality of patients on hemodialysis . Failure of a newly created AVF to mature and development of stenosis in an established AVF are two common clinical predicaments. The most common cause of mature AVF failure is stenosis of the venous segment, with 20–40% of cases occurring within the first few centimeters of the vein distal (upstream) to the anastomosis, known as the “swing segment” . A distal swing segment is the segment of the native vein that is mobilized during radialcephalic, brachial-cephalic, and transposed brachial-basilic fistula creation. A proximal swing segment occurs in the basilic vein near the axillary region during transposition surgery . A naturally occurring swing segment occurs in the arch of the cephalic vein or cephalic arch segment as it drains into the axillary vein. This segment of the vein can experience turbulent flow and altered shear mechanical stress because it forms the outflow conduit for autogenous radial-cephalic and brachial-cephalic fistulas . Chang et al  observed that infiltration by macrophages and lymphocytes in the vascular lining of an obstructed AVF caused considerably increased inflammatory activity. The endothelium plays a vital role in preventing thrombosis, regulating coagulation, and lipid transport . Atherosclerosis can lead to disruptions in the vascular endothelium, enabling platelet accumulation on the endothelium and initiating clotting. This can potentially degenerate into vessel obstruction . When the endothelium deteriorates, endothelial cells produce and release a variety of substances, including plasminogen-activator inhibitor-1, von Willebrand factor, thromboxane A2, fibrinogen, and tissue factor, which can be used as indicators of the degree of endothelial disruption [26,27]. A double blind randomized controlled study aimed to verify that ticlopidine is a successful and harmless way to decrease AVF early failure rates . For one week prior to the procedure and for four weeks following it, medication (either placebo or ticlopidine) was administered to study participants. The findings revealed that 19% of study subjects given the placebo developed thrombosis, whereas only 12% of the study subjects given ticlopidine developed thrombosis. However, the results did not reveal that ticlopidine had any noteworthy effect on preventing thrombosis following AVF procedures. Dember et al  carried out a randomized, double blind, and placebo-controlled trial in numerous centers in the United States, which focused on the effects of clopidogrel administration in a sample of 877 patients with advanced chronic kidney disease (CKD) or ESRD who had just undergone surgery for fistula construction. Fistula thrombosis occurred in 53 (12.2%) participants assigned to clopidogrel and 84 (19.5%) participants assigned to placebo (relative risk, 0.63; 95% CI, 0.46–0.97; P = 0.018). A systematic review was conducted to identify the influence of adjuvant drug therapy on fistula and graft patency rates in patients diagnosed with ESRD . The review included 10 randomized controlled trials using anti-thrombotic drug treatment or anti-platelet drugs such as ticlodipine, aspirin, dipyridamole, and clopidogrel to prevent blockages in artery and vein access points for dialysis. Results showed that antiplatelet drugs, including ticlopidine, aspirin, and clopidogrel, had a positive influence. This indicates that the administration of antiplatelet drugs to patients with AVF is feasible. However, most of the included trials had a short follow-up period, so the long-term benefits are not clear. Furthermore, long-term safety concerns of anti-platelet agents used for this purpose are not clear. The role of serum lipid profiles in AVF maturation is still largely unknown. Kirkpantur et al  conducted a retrospective three-year study on a group of 99 patients to analyze the connection between serum lipid profile and fistula thrombosis. Study results showed that serum levels of cholesterol and triglycerides in patients with fistula thrombosis and those with functional fistulae were similar. Nonetheless, the former patients had considerably reduced high-density lipoprotein and albumin, as well as higher low-density lipoprotein and serum C-reactive protein levels than the latter group of patients. Features of classic uremic dyslipidemia include high levels of triglycerides, reduced high-density lipoprotein, and reduced overall concentration of cholesterol. Advanced kidney failure enhances these features, whereas renal replacement therapy and co-morbidities such as diabetes mellitus alter the features . In association with CKD, atherosclerosis progresses more rapidly and manifests as extremely calcified plaques that adhere to the subintimal layers of the artery wall. In high concentrations, lipids interfere with mediators (angiotensin II, endothelin-1, plasminogen activator inhibitor-1, prostacylin, and nitric oxide) that impact renal function . A long-term case-control study in 60 patients with autologous AVF was carried out to analyze the effects of drugs or factors on AVF patency. Mean follow up time was 25 months. The study results showed improved fistula patency (71.5% vs. 39.1%) at 2 years in patients taking folic acid and statins compared to those on no statin therapy . In this small single center study, no significant difference was noted in high density lipoprotein, low density lipoprotein, triglycerides, or total cholesterol, except homocysteine (P < 0.01). In AVFs, thrombosis can also be caused by inflammation. Churchill et al  found that AVG obstruction was most frequently determined by hypoalbuminemia. Further studies have revealed that, apart from being a sign of dietary deficiency in uremic patients, hypoalbuminemia is also a symptom of inflammation [36,37]. The indirect conclusion drawn from these results is that inflammation is involved in AVF thrombosis. The association between endothelial function and early stage progressive kidney disease has been investigated as a means of uncovering if clinically evident atherosclerotic vascular disease in CKD patients is linked to endothelial function abnormalities . Endothelial cell dysfunction is often observed in individuals with impaired kidney function [39,40]. Plasma from patients with ESRD or uremic toxins inhibits fundamental endothelial cell biological processes such as viability, proliferation, migration, and wound healing [41,42]. Abnormalities in these endothelial cell functions play a key role in vascular remodeling, especially at the site of dialysis vascular access. AVFs require rapid proliferation of endothelial cells to restore the barrier, permeability, and biochemical regulatory functions of endothelial cells to control vascular repair, local thrombosis, inflammation, and neointimal hyperplasia . Since uremia inhibits endothelial cell proliferation and migration to eventually result in abnormal vascular remodeling, neointimal hyperplasia at the site of vascular access anastomosis is common. This results in primary access failure and ineffective dialysis . Endothelial function is associated with arterial and venous remodeling, as determined by basic hemodynamic principles . As more blood is delivered through the venous outflow limb of the AVF, wall shear stress, which is proportional to the amount of blood flow velocity and lumen diameter, will rise. Theoretically, this should lead to venous dilation to normalize the shear stress. There is a high degree of correlation between the flow rate through an AVF and the venous diameter, indicating that flow is a primary determinant of final venous diameter [45,46]. It is likely that the magnitude of remodeling depends on hemodynamic stimuli, endothelium-derived mediators, and baseline stiffness of the vessels. Inadequate vessels used to construct AVFs are another cause of AVF failure. Allon and Robbin  have proposed the use of pre-surgery ultrasound assessment to ensure that the chosen vessels can support the construction of an AVF. Khavanin et al  conducted a cross-sectional study using a sample of 96 patients on hemodialysis with native AVF to determine the relation between diameter and maturation of AVF. Study results found an association between vein diameter (mean vein diameter was 2.40 mm) and the success rate of fistula development; however, a similar connection was not observed between fistula maturation and artery diameter (mean diameter of artery was 2.57 mm). Clinical examination and Doppler ultrasound measurements are the mainstays of current preoperative assessment . The most preferred type of vascular access used for hemodialysis is AVF [50,51]. Nevertheless, there has been an increase in the rate of AVF failure in the last three decades, caused by a growing number of elderly patients with CKD who also suffer from diabetes or vascular disease. As noted by Aronson et al , the changes in metabolism that accompany diabetes can manifest as pro-thrombotic situations, endothelial damage, deregulated growth factors, and increased extracellular matrix deposition. Inflammation can participate in the initial development of AVF stenosis and thrombosis [21,53]. A retrospective study was performed on 31 patients with AVF to identify factors that can influence AVF remodeling . The results indicated that diabetes is a significant negative predictor of venous remodeling. However, the sample size was small, and the significance of the findings are questionable. Endothelial dysfunction has been explained as imbalance between the amount of vaso-dilatory and vaso-constricting substances generated by the endothelium or between general endothelial activities . Endothelial dysfunction can be a part of the mechanisms of a number of diseases, including diabetes mellitus, hypertension, or hypercholesterolemia. Endothelial dysfunction can also arise from environmental factors, such as exposure to air pollution and smoking tobacco products . Endothelium deregulation manifests as decreased production of nitric oxide, increased platelet aggregation, and anticoagulant features . All of these aspects play a role in the occurrence of vascular problems such as atherosclerosis in patients with diabetes. A key component of AVF maturation is adequate dilation of the outflow vein. Changes in blood flow induce vascular remodeling, and the endothelium controls the response to flow changes [58,59]. Upon damage to the vein during AVF construction, the endothelium is disturbed, impairing venous remodeling. Risk factors such as cardiovascular disease, hyperlipidemia, and hypertension poorly predict AVF non-maturation, prompting investigations into other risk factors such as hemodynamic profile or vessel morphology . Endothelial function is impaired in hypertension, which decreases vascular relaxation and initiates inflammatory cell infiltration in blood vessels [61,62]. Macrophages and T cells represent basic pathologic features of the development of atherosclerosis. From their initial location in elastic arteries in spaces that do not experience extreme shear stress, these features then propagate to the innermost membrane of smooth muscle cells, where they deposit connective tissues and initiate neovascularization . Other studies, however, did not support hypertension as a major risk factor for AVF maturation [64,65]. A recent study by Kim et al  performed a single center cohort study (38 men and 12 women) to assess patient factors, vein diameter, and distensability of the radiocephalic vein at the wrist. Study analysis did not find any positive correlation between AVF maturation and patient factors of hypertension, diabetes, and gender. However, the sample size was not large enough to detect the effect between AVF maturation and hypertension. The prevalence of PVD in people with diabetes is four times higher than in those without diabetes . PVD develops gradually as a result of systemic atherosclerosis. Together with coronary artery disease and cerebrovascular disease, PVD represents one of the three main manifestations of atherothrombosis . Atherothrombosis is a thrombus that develops atop a ruptured plaque situated at an afflicted part of the artery. Atherosclerotic plaques also form at vessel bifurcation points, possibly because of damaged protection mechanisms and disruptions in blood flow at these sites . In the case of AVF used for hemodialysis access, vessel thrombosis represents the major factor that determines AVF failure. Chang et al  argued that vascular inflammation can participate in this process, as it represents a significant symptom of vascular diseases. Ku et al  recruited 43 pre-dialysis patients awaiting AVF creation for the first time to compare the intima media thickness of vessels among uremic patients, uncomplicated hypertensive patients, and healthy subjects using ultrasonographic measurements. Study findings reported that intima media thickness measurements during pre-operative Doppler ultrasound imaging significantly correlated to histologic measures and, more importantly, to AVF thrombosis and inadequacy of an AVF to maintain dialysis at one year. Similarly, a single center cross sectional study of 225 patients was conducted to evaluate the relationship between ankle-brachial pressure index (ABPI) < 0.9 and vascular access failure. Study findings showed that ABPI is a reliable marker for PVD and has a significant association with access failure after adjusting for other variables . However, the study subjects were only from one regional hospital, and the study was observational. Therefore, it is susceptible to selection bias. Churchill et al  and Reilly et al  have analyzed the influence of smoking history on vascular access morbidity but did not obtain any conclusive results. Wetzig et al  had shown earlier that smokers undergoing hemodialysis exhibited an increased prevalence of early or late AVF failure. The discrepancies observed in the results could be because earlier peripheral vascular impairment in former and current smokers can trigger acute AVF obstruction. Ozdemir et al  examined the effects of smoking and blood eosinophil count on AVF maturation. This cross-sectional study included 141 patients with advanced renal failure. AVF thrombosis was detected in 60 patients; in contrast, 81 patients had no thrombosis. The study findings strongly indicate that smoking in conjunction with a high amount of blood eosinophils can play a role in AVF failure. One limitation of the study was its retrospective nature and it was limited to a single center. In addition, progression of atherosclerosis and ischemic nephropathy might play a role . Endothelial dysfunction can be accompanied by other factors that increase the likelihood of developing atherosclerosis, including oxidized lipids, diabetes mellitus, and smoking [75,76]. Endothelial dysfunction generates a number of biological effects that aid in the advancement of atherosclerosis, such as vasoregulation , enhanced blood coagulation , facilitation of penetration of inflammatory cells and lipids into the innermost wall layer , and enhancement of the movement and multiplication of vascular smooth muscle cells . The number of obese patients with ESRD who also are diagnosed with type 2 diabetes is constantly growing . This group of patients is associated with a higher rate of AVF failure as they are predisposed to arteriosclerosis, and vessels in the forearm are more difficult to reach due to thick fat tissue . This also increases the difficulty of performing phlebotomy on fistulae situated at a considerable depth. Chan et al  carried out a retrospective cohort study on a group of 1,486 patients to analyze the connection between obesity and vascular access complications using BMI less than 30 kg/m2 as a reference for obesity. The study results found no connection between obesity and a higher rate of fistula failure; however, a relationship between insufficient fistula development and high BMI was observed (odds ratio, 3.66; 95% CI, −1.27 to 10.55, P = 0.017). Because this study represents fistula outcomes from a single dialysis center, the findings might not generalize to all dialysis centers. For example, in centers not using routine preoperative vascular mapping, the frequency of fistula placement might be lower in obese patients than in non-obese patients. The prevalence of fistulae was lower in females, patients with PVD, black patients, obese patients, and older patients [6,83]. In obese patients, low rates of long-term AVF preservation are usually caused by early vessel thrombosis, which is considered to degenerate from advanced myointimal hyperplasia, resulting in earlier vessel stenosis. This theory is corroborated by the connection between hyperinsulinemia, high levels of serum interleukin 6, advanced myointimal hyperplasia, and increased incidence of vessel thrombosis in patients undergoing hemodialysis . Interleukin 6 stimulates the production of C-reactive protein, and high levels of C-reactive protein have been recorded in obese patients . Another study revealed that C-reactive protein contributes to advancement of myointimal hyperplasia, which provides further evidence of the high rate of AVF failure in obese patients. Late referral of patients initiating dialysis therapy with a temporary CVC can impair patency rate and fistula maturation. If a fistula is constructed after the patient has begun dialysis therapy, hemodialysis treatment can be extended with a temporary CVC. This can lead to the development of a number of complications, such as insufficient blood flow, hematoma formation, recurrent thrombosis or failure, fibrosis, vessel wall damage, and bacteremia [86,87]. Previous studies examined complications related to CVC use before AVF construction and reported venous thrombosis rates as high as 58%, with a susceptibility for thrombosis in the cephalic and basilic veins [88,89]. Prospective observational study results have shown that temporary catheter use at the initiation of dialysis is linked to a higher risk of vascular access failure . The authors hypothesized that AVF patency rates and maturation are influenced by catheter utilization and related problems. This research used a substantial study sample of dialysis patients (n = 3,674) and involved an epidemiological study that included over 300 institutions across Europe, America, and Japan. However, as pointed out by the authors, a causal link between cannulation and catheter utilization and subsequent fistula failure cannot be made because the study was observational. Successful vascular access provision is the foundation for successful hemodialysis. Determining the proper type of vascular access has prime significance for maximizing successful maturation of a fistula and avoiding surgical revision. Unfortunately, there are no consistent criteria that can be applied before creation of AVFs at present. The surgeon has to rely on clinical judgement and other investigatory parameters including a pre-operative duplex scan, which has a major role in determining the success of fistula maturation. Although there is no consensus, AVF selection (rather than AVG) is the recommended access for hemodialysis, as AVGs are 3.8 times more likely to require a thrombectomy and 3 times more likely to require access intervention than AVF. Further research studies are needed to determine how to predict, prevent, or treat failure of AVF maturation. Fig. 1. 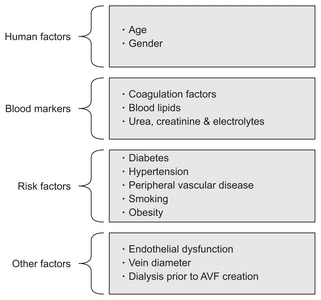 Factors affecting the maturation of arteriovenous fistula (AVF). Konner, K, Nonnast-Daniel, B, and Ritz, E (2003). The arteriovenous fistula. J Am Soc Nephrol. 14, 1669-1680. Vascular Access 2006 Work Group (2006). Clinical practice guidelines for vascular access. Am J Kidney Dis. 48, S176-S247. Irish, A, Dogra, G, and Mori, T (2009). Preventing AVF thrombosis: the rationale and design of the Omega-3 fatty acids (Fish Oils) and Aspirin in Vascular access OUtcomes in REnal Disease (FAVOURED) study. BMC Nephrol. 10, 1. Dunn, JC, Rowe, VL, and Woo, K (2015). PC106. Regional practice patterns for hemodialysis access in the vascular quality initiative. J Vasc Surg. 61, 145S-146S. Asano, M, Thumma, J, and Oguchi, K (2013). Vascular access care and treatment practices associated with outcomes of arteriovenous fistula: international comparisons from the Dialysis Outcomes and Practice Patterns Study. Nephron Clin Pract. 124, 23-30. Allon, M, Ornt, DB, and Schwab, SJ (2000). Factors associated with the prevalence of arteriovenous fistulas in hemodialysis patients in the HEMO study. Hemodialysis (HEMO) Study Group. Kidney Int. 58, 2178-2185. Pisoni, RL, Young, EW, and Dykstra, DM (2002). Vascular access use in Europe and the United States: results from the DOPPS. Kidney Int. 61, 305-316. Manns, B, Tonelli, M, and Yilmaz, S (2005). Establishment and maintenance of vascular access in incident hemodialysis patients: a prospective cost analysis. J Am Soc Nephrol. 16, 201-209. Mendes, RR, Farber, MA, Marston, WA, Dinwiddie, LC, Keagy, BA, and Burnham, SJ (2002). Prediction of wrist arteriovenous fistula maturation with preoperative vein mapping with ultrasonography. J Vasc Surg. 36, 460-463. Lazarides, MK, Georgiadis, GS, Antoniou, GA, and Staramos, DN (2007). A meta-analysis of dialysis access outcome in elderly patients. J Vasc Surg. 45, 420-426. Swindlehurst, N, Swindlehurst, A, Lumgair, H, Rebollo Mesa, I, Mamode, N, and Cacciola, R (2011). Vascular access for hemodialysis in the elderly. J Vasc Surg. 53, 1039-1043. Jennings, WC, Kindred, MG, and Broughan, TA (2009). Creating radiocephalic arteriovenous fistulas: technical and functional success. J Am Coll Surg. 208, 419-425. Kim, YO, Choi, YJ, and Kim, JI (2006). The impact of intima-media thickness of radial artery on early failure of radiocephalic arteriovenous fistula in hemodialysis patients. J Korean Med Sci. 21, 284-289. Yan, TK, Lin, S, Jia, JY, Li, YP, Shang, WY, and Wei, L (2010). Zhonghua Nei Ke Za Zhi. 49, 577-581. Lok, CE, Oliver, MJ, Su, J, Bhola, C, Hannigan, N, and Jassal, SV (2005). Arteriovenous fistula outcomes in the era of the elderly dialysis population. Kidney Int. 67, 2462-2469. Weale, AR, Bevis, P, and Neary, WD (2008). Radiocephalic and brachiocephalic arteriovenous fistula outcomes in the elderly. J Vasc Surg. 47, 144-150. Astor, BC, Coresh, J, Powe, NR, Eustace, JA, and Klag, MJ (2000). Relation between gender and vascular access complications in hemodialysis patients. Am J Kidney Dis. 36, 1126-1134. Rooijens, PP, Tordoir, JH, Stijnen, T, Burgmans, JP, Smet de, AA, and Yo, TI (2004). Radiocephalic wrist arteriovenous fistula for hemodialysis: meta-analysis indicates a high primary failure rate. Eur J Vasc Endovasc Surg. 28, 583-589. Conte, MS, Nugent, HM, Gaccione, P, Guleria, I, Roy-Chaudhury, P, and Lawson, JH (2009). Multicenter phase I/II trial of the safety of allogeneic endothelial cell implants after the creation of arteriovenous access for hemodialysis use: the V-HEALTH study. J Vasc Surg. 50, 1359-1368.e1. Badero, OJ, Salifu, MO, Wasse, H, and Work, J (2008). Frequency of swing-segment stenosis in referred dialysis patients with angiographically documented lesions. Am J Kidney Dis. 51, 93-98. Rajan, DK, Clark, TW, Patel, NK, Stavropoulos, SW, and Simons, ME (2003). Prevalence and treatment of cephalic arch stenosis in dysfunctional autogenous hemodialysis fistulas. J Vasc Interv Radiol. 14, 567-573. Chang, CJ, Ko, YS, and Ko, PJ (2005). Thrombosed arteriovenous fistula for hemodialysis access is characterized by a marked inflammatory activity. Kidney Int. 68, 1312-1319. Pearson, JD (1994). Vessel wall interactions regulating thrombosis. Br Med Bull. 50, 776-788. Galley, HF, and Webster, NR (2004). Physiology of the endothelium. Br J Anaesth. 93, 105-113. Verma, S, and Anderson, TJ (2002). Fundamentals of endothelial function for the clinical cardiologist. Circulation. 105, 546-549. Gröntoft, KC, Larsson, R, Mulec, H, Weiss, LG, and Dickinson, JP (1998). Effects of ticlopidine in AV-fistula surgery in uremia. Fistula Study Group. Scand J Urol Nephrol. 32, 276-283. Dember, LM, Beck, GJ, and Allon, M (2008). Effect of clopidogrel on early failure of arteriovenous fistulas for hemodialysis: a randomized controlled trial. JAMA. 299, 2164-2171. Osborn, G, Escofet, X, and Da Silva, A (2008). Medical adjuvant treatment to increase patency of arteriovenous fistulae and grafts. Cochrane Database Syst Rev, CD002786. Kirkpantur, A, Arici, M, and Altun, B (2008). Association of serum lipid profile and arteriovenous fistula thrombosis in maintenance hemodialysis patients. Blood Purif. 26, 322-332. Chan, MR, Young, HN, Becker, YT, and Yevzlin, AS (2008). Obesity as a predictor of vascular access outcomes: analysis of the USRDS DMMS Wave II study. Semin Dial. 21, 274-279. Heymann, EP, Kassimatis, TI, and Goldsmith, DJ (2012). Dyslipidemia, statins, and CKD patients’ outcomes - review of the evidence in the post-sharp era. J Nephrol. 25, 460-472. Righetti, M, Ferrario, G, Serbelloni, P, Milani, S, and Tommasi, A (2009). Some old drugs improve late primary patency rate of native arteriovenous fistulas in hemodialysis patients. Ann Vasc Surg. 23, 491-497. Churchill, DN, Taylor, DW, and Cook, RJ (1992). Canadian hemodialysis morbidity study. Am J Kidney Dis. 19, 214-234. Kaysen, GA, and Don, BR (2003). Factors that affect albumin concentration in dialysis patients and their relationship to vascular disease. Kidney Int Suppl, S94-S97. Kaysen, GA, Dubin, JA, Müller, HG, Rosales, LM, and Levin, NW (2000). The acute-phase response varies with time and predicts serum albumin levels in hemodialysis patients. The HEMO Study Group. Kidney Int. 58, 346-352. Thambyrajah, J, Landray, MJ, McGlynn, FJ, Jones, HJ, Wheeler, DC, and Townend, JN (2000). Abnormalities of endothelial function in patients with predialysis renal failure. Heart. 83, 205-209. Yu, Y, and Lyons, TJ (2005). A lethal tetrad in diabetes: hyperglycemia, dyslipidemia, oxidative stress, and endothelial dysfunction. Am J Med Sci. 330, 227-232. Annuk, M, Lind, L, Linde, T, and Fellström, B (2001). Impaired endothelium-dependent vasodilatation in renal failure in humans. Nephrol Dial Transplant. 16, 302-306. Vanholder, R, Argilés, A, and Baurmeister, U (2001). Uremic toxicity: present state of the art. Int J Artif Organs. 24, 695-725. Cardinal, H, Raymond, MA, Hébert, MJ, and Madore, F (2007). Uraemic plasma decreases the expression of ABCA1, ABCG1 and cell-cycle genes in human coronary arterial endothelial cells. Nephrol Dial Transplant. 22, 409-416. Cowan, DB, and Langille, BL (1996). Cellular and molecular biology of vascular remodeling. Curr Opin Lipidol. 7, 94-100. Roy-Chaudhury, P, Sukhatme, VP, and Cheung, AK (2006). Hemodialysis vascular access dysfunction: a cellular and molecular viewpoint. J Am Soc Nephrol. 17, 1112-1127. Owens, CD, Wake, N, Kim, JM, Hentschel, D, Conte, MS, and Schanzer, A (2010). Endothelial function predicts positive arterial-venous fistula remodeling in subjects with stage IV and V chronic kidney disease. J Vasc Access. 11, 329-334. Wedgwood, KR, Wiggins, PA, and Guillou, PJ (1984). A prospective study of end-to-side vs. side-to-side arteriovenous fistulas for haemodialysis. Br J Surg. 71, 640-642. Allon, M, and Robbin, ML (2002). Increasing arteriovenous fistulas in hemodialysis patients: problems and solutions. Kidney Int. 62, 1109-1124. Khavanin Zadeh, M, Gholipour, F, Naderpour, Z, and Porfakharan, M (2012). Relationship between vessel diameter and time to maturation of arteriovenous fistula for hemodialysis access. Int J Nephrol. 2012, 942950. McGrogan, DG, Maxwell, AP, Khawaja, AZ, and Inston, NG (2015). Current tools for prediction of arteriovenous fistula outcomes. Clin Kidney J. 8, 282-289. Castledine, C, Casula, A, and Fogarty, D (2012). UK Renal Registry 14th Annual Report: Chapter 2 UK RRT Prevalence in 2010: National and centre-specific analyses. Nephron Clin Pract. 120, c29-c54. Aronson, D, Bloomgarden, Z, and Rayfield, EJ (1996). Potential mechanisms promoting restenosis in diabetic patients. J Am Coll Cardiol. 27, 528-535. Marrone, D, Pertosa, G, and Simone, S (2007). Local activation of interleukin 6 signaling is associated with arteriovenous fistula stenosis in hemodialysis patients. Am J Kidney Dis. 49, 664-673. Conte, MS, Nugent, HM, Gaccione, P, Roy-Chaudhury, P, and Lawson, JH (2011). Influence of diabetes and perivascular allogeneic endothelial cell implants on arteriovenous fistula remodeling. J Vasc Surg. 54, 1383-1389. Deanfield, J, Donald, A, and Ferri, C (2005). Endothelial function and dysfunction. Part I: Methodological issues for assessment in the different vascular beds: a statement by the Working Group on Endothelin and Endothelial Factors of the European Society of Hypertension. J Hypertens. 23, 7-17. Cai, H, and Harrison, DG (2000). Endothelial dysfunction in cardiovascular diseases: the role of oxidant stress. Circ Res. 87, 840-844. Al-Isa, AN, Thalib, L, and Akanji, AO (2010). Circulating markers of inflammation and endothelial dysfunction in Arab adolescent subjects: reference ranges and associations with age, gender, body mass and insulin sensitivity. Atherosclerosis. 208, 543-549. Dammers, R, Tordoir, JH, and Kooman, JP (2005). The effect of flow changes on the arterial system proximal to an arterio-venous fistula for hemodialysis. Ultrasound Med Biol. 31, 1327-1333. Ene-Iordache, B, Mosconi, L, and Antiga, L (2003). Radial artery remodeling in response to shear stress increase within ar-teriovenous fistula for hemodialysis access. Endothelium. 10, 95-102. Kharboutly, Z, Fenech, M, Treutenaere, JM, Claude, I, and Legallais, C (2007). Investigations into the relationship between hemodynamics and vascular alterations in an established arteriovenous fistula. Med Eng Phys. 29, 999-1007. Taddei, S, Virdis, A, Ghiadoni, L, Sudano, I, and Salvetti, A (2001). Endothelial dysfunction in hypertension. J Cardiovasc Pharmacol. 38, S11-S14. Satoh, M (2012). Endothelial dysfunction as an underlying pathophysiological condition of chronic kidney disease. Clin Exp Nephrol. 16, 518-521. Kim, JT, Chang, WH, Oh, TY, and Jeong, YK (2011). Venous distensibility as a key factor in the success of arteriovenous fistulas at the wrist. Ann Vasc Surg. 25, 1094-1098. Lauvao, LS, Ihnat, DM, Goshima, KR, Chavez, L, Gruessner, AC, and Mills, JL (2009). Vein diameter is the major predictor of fistula maturation. J Vasc Surg. 49, 1499-1504. Gregg, EW, Sorlie, P, and Paulose-Ram, R (2004). Prevalence of lower-extremity disease in the US adult population ≥40 years of age with and without diabetes: 1999–2000 national health and nutrition examination survey. Diabetes Care. 27, 1591-1597. Hiatt, WR, Hoag, S, and Hamman, RF (1995). Effect of diagnostic criteria on the prevalence of peripheral arterial disease. The San Luis Valley Diabetes Study. Circulation. 91, 1472-1479. Warboys, CM, Amini, N, de Luca, A, and Evans, PC (2011). The role of blood flow in determining the sites of atherosclerotic plaques. F1000 Med Rep. 3, 5. Ku, YM, Kim, YO, and Kim, JI (2006). Ultrasonographic measurement of intima-media thickness of radial artery in pre-dialysis uraemic patients: comparison with histological examination. Nephrol Dial Transplant. 21, 715-720. Chen, SC, Chang, JM, and Hwang, SJ (2009). Significant correlation between ankle-brachial index and vascular access failure in hemodialysis patients. Clin J Am Soc Nephrol. 4, 128-134. Reilly, DT, Wood, RF, and Bell, PR (1982). Prospective study of dialysis fistulas: problem patients and their treatment. Br J Surg. 69, 549-553. Wetzig, GA, Gough, IR, and Furnival, CM (1985). One hundred cases of arteriovenous fistula for haemodialysis access: the effect of cigarette smoking on patency. Aust N Z J Surg. 55, 551-554. Ozdemir, FN, Akcay, A, Bilgic, A, Akgul, A, Arat, Z, and Haberal, M (2005). Effects of smoking and blood eosinophil count on the development of arteriovenous fistulae thrombosis in hemodialysis patients. Transplant Proc. 37, 2918-2921. Ritz, E, and Orth, SR (2000). Adverse effect of smoking on the renal outcome of patients with primary hypertension. Am J Kidney Dis. 35, 767-769. Brunner, H, Cockcroft, JR, and Deanfield, J (2005). Endothelial function and dysfunction. Part II: Association with cardiovascular risk factors and diseases. A statement by the Working Group on Endothelins and Endothelial Factors of the European Society of Hypertension. J Hypertens. 23, 233-246. Wilson, PW (2004). Assessing coronary heart disease risk with traditional and novel risk factors. Clin Cardiol. 27, III7-III11. Landmesser, U, Hornig, B, and Drexler, H (2004). Endothelial function: a critical determinant in atherosclerosis?. Circulation. 109, II27-II33. Bombeli, T, Karsan, A, Tait, JF, and Harlan, JM (1997). Apoptotic vascular endothelial cells become procoagulant. Blood. 89, 2429-2442. Schwartz, BR, Karsan, A, Bombeli, T, and Harlan, JM (1999). A novel beta 1 integrin-dependent mechanism of leukocyte adherence to apoptotic cells. J Immunol. 162, 4842-4848. Raymond, MA, Désormeaux, A, and Laplante, P (2004). Apoptosis of endothelial cells triggers a caspase-dependent anti-apoptotic paracrine loop active on VSMC. FASEB J. 18, 705-707. Postorino, M, Marino, C, Tripepi, G, Zoccali, C, and CREDIT (Calabria Registry of Dialysis and Transplantation) Working Group (2009). Abdominal obesity and all-cause and cardiovascular mortality in end-stage renal disease. J Am Coll Cardiol. 53, 1265-1272. Kats, M, Hawxby, AM, Barker, J, and Allon, M (2007). Impact of obesity on arteriovenous fistula outcomes in dialysis patients. Kidney Int. 71, 39-43. Weyde, W, Krajewska, M, and Letachowicz, W (2008). Obesity is not an obstacle for successful autogenous arteriovenous fistula creation in haemodialysis. Nephrol Dial Transplant. 23, 1318-1322. De Marchi, S, Falleti, E, and Giacomello, R (1996). Risk factors for vascular disease and arteriovenous fistula dysfunction in hemodialysis patients. J Am Soc Nephrol. 7, 1169-1177. Ramkumar, N, Cheung, AK, Pappas, LM, Roberts, WL, and Beddhu, S (2004). Association of obesity with inflammation in chronic kidney disease: a cross-sectional study. J Ren Nutr. 14, 201-207. Ravani, P, Brunori, G, and Mandolfo, S (2004). Cardiovascular co-morbidity and late referral impact arteriovenous fistula survival: a prospective multicenter study. J Am Soc Nephrol. 15, 204-209. Avorn, J, Winkelmayer, WC, and Bohn, RL (2002). Delayed nephrologist referral and inadequate vascular access in patients with advanced chronic kidney failure. J Clin Epidemiol. 55, 711-716. Abdullah, BJ, Mohammad, N, and Sangkar, JV (2005). Incidence of upper limb venous thrombosis associated with peripherally inserted central catheters (PICC). Br J Radiol. 78, 596-600. Allen, AW, Megargell, JL, and Brown, DB (2000). Venous thrombosis associated with the placement of peripherally inserted central catheters. J Vasc Interv Radiol. 11, 1309-1314. Rayner, HC, Pisoni, RL, and Gillespie, BW (2003). Creation, cannulation and survival of arteriovenous fistulae: data from the Dialysis Outcomes and Practice Patterns Study. Kidney Int. 63, 323-330.